Once a year I make a pilgrimage to chilly Michigan to see my parents for two weeks. It is always a nice thing to visit the family; however, I find the trip can be enhanced with some serious anstetic. Every year I pack six bottles (one case) for this two week internment in the mitten state. This years line up: 2x Supernova 2010, 2x Rollercoaster, Ardbeg 10, and Uigeadial. One may assume I am planning to stay intoxicated for two solid weeks; however, I will be sharing a bit of that with others–just a bit. Really, what in life isnt better with whiskey? 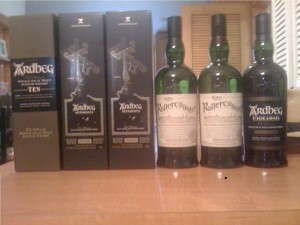 Perhaps this would be a good moment to rate the whiskeys I brought? Did you end up opening a 2nd bottle of the SN2010 or RC? as I found this post att thhis website.